Creeping fig grows on the opposite side of the house, but it has been slower to grow in this narrow spot, which is partially covered but still receives a lot of sun. I had been pondering the best way to replant this area when an idea began to form. 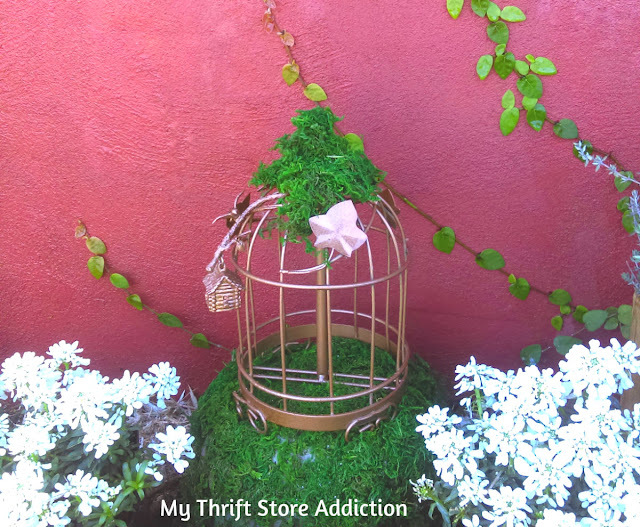 I was further inspired by finding random bits and pieces from my thrifting adventures. I envisioned an enchanted fairy garden flower bed next to my front walkway. 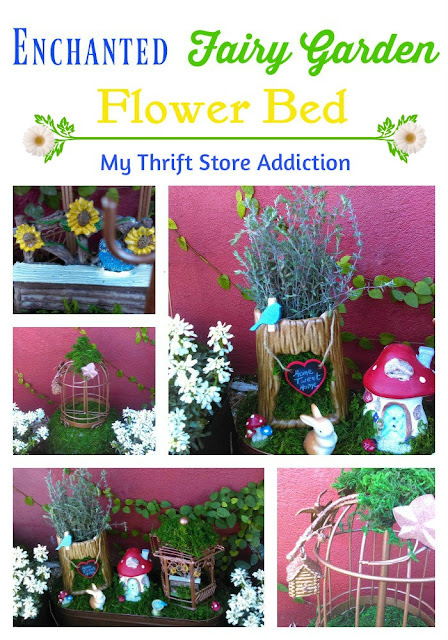 I plan to mix herbs and bedding plants with repurposed thrift store finds which will give the long narrow space the illusion of a never-ending fairy forest that I can continue to add to over time. Here's the eclectic thrifted pieces I gathered so far. With these in mind, I decided to arrange a scene on top of an inverted copper tub. This would allow small pieces to be more visible without getting lost in the space. 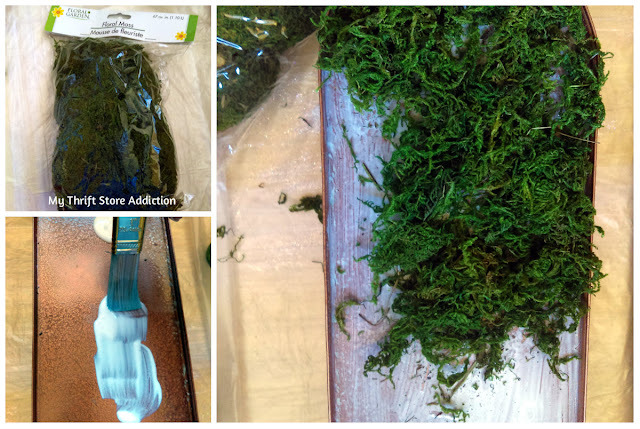 First, I glued dollar store floral moss on top. I used it to line the tree trunk planter too. 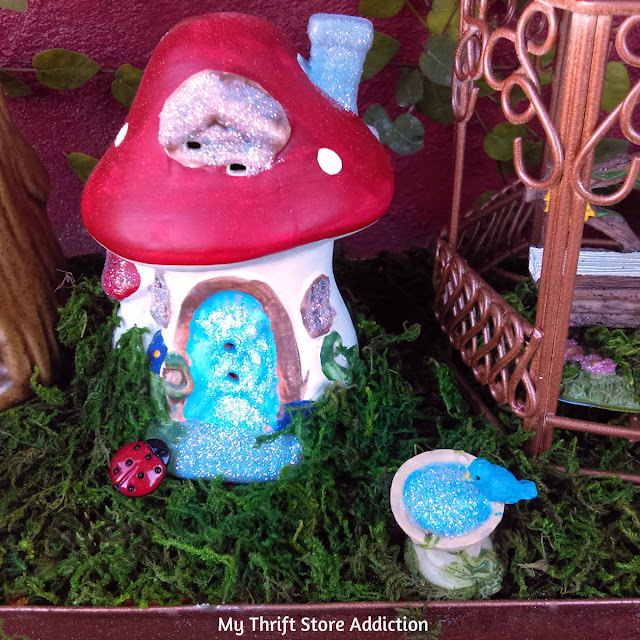 When I bought the floral moss at Dollar Tree, I was thrilled to find an assortment of fairy garden supplies that I could add to my enchanted forest. The little houses are ceramic and the rest of the pieces are resin. I bought a few of each because I knew they'd be gone fast. Ready to see how it all came together? 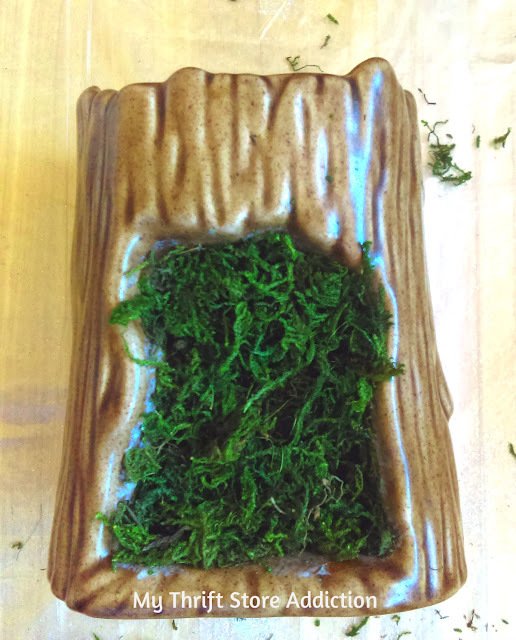 I'd known as soon as I saw the tree trunk that I wanted to plant it with herbs. I think the thyme really gives it a realistic tree look. ...look how perfectly the tiny dollar store garden bench fits inside! 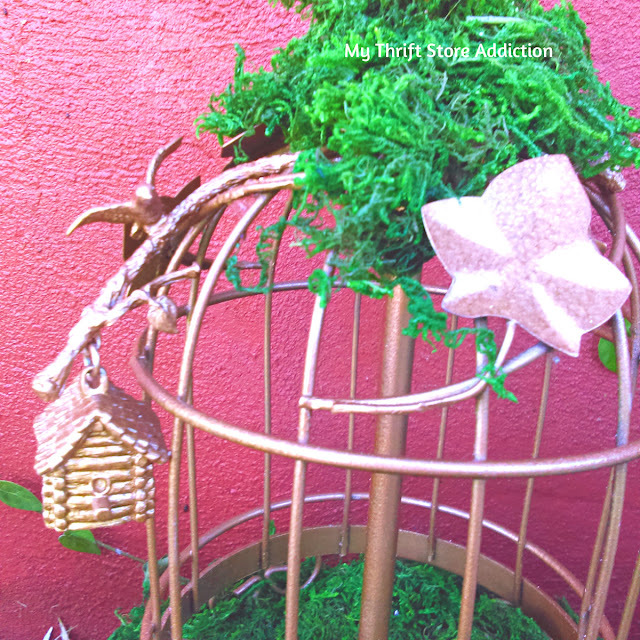 On Wednesday, I'll be sharing details on how I upcycled each of the dollar store fairy pieces, plus another fun way to use them. Here's a peek at the inverted copper tub garden placed in the flower bed. On its left is the broken birdcage lamp I mentioned earlier. I planted several pots of candytuft--did you know it's considered an herb with medicinal qualities? White flowers are a favorite of mine and these reflected the natural light so much in the photos, they almost don't look real! 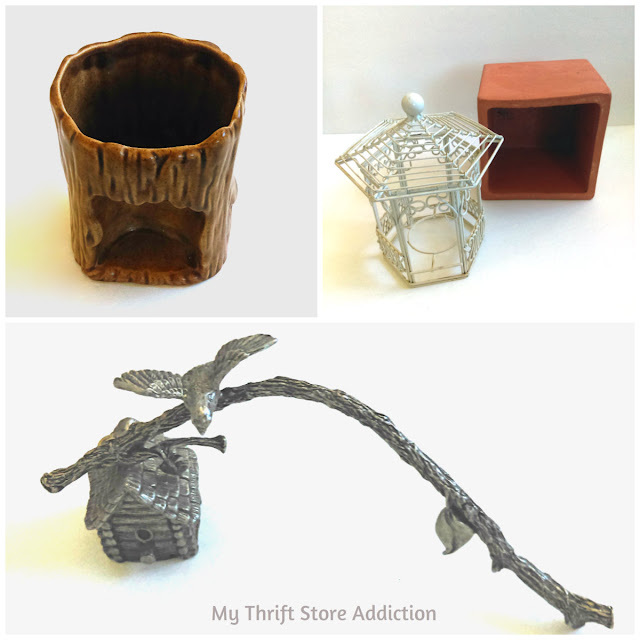 The birdhouse candle snuffer dangles from the birdcage as if it were meant to hang there. I'm on the lookout for just the right birds to nest inside. Affiliate links provided for suggested supplies. See full disclosure here. Here, a view from the top. This section is a little less than half of the flower bed so I'll probably post a sequel as I add to it. The creeping fig will spread and once it's officially spring I'll add more herbs and flowers. 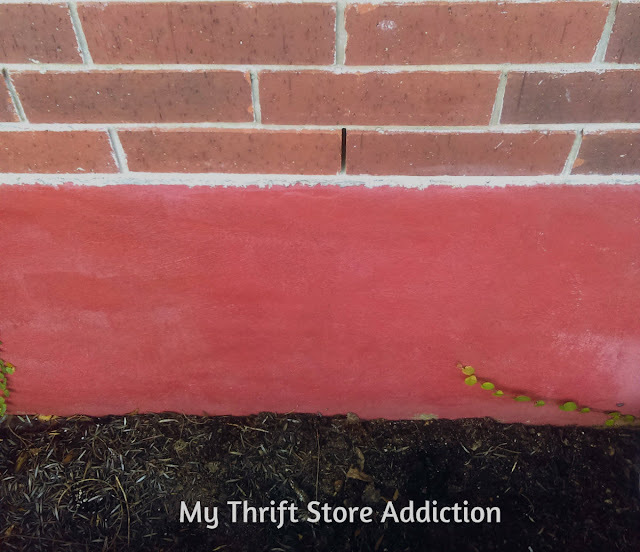 What a great idea to fill in a bare spot! I can't wait till Spring arrives here to replant my fairy garden. I did not know the Dollar Tree had fairy things! Wonderful idea for a small space! I have some fairy doors on my house, and one in the garden. It is a fun thing to discover when looking at the flowers. 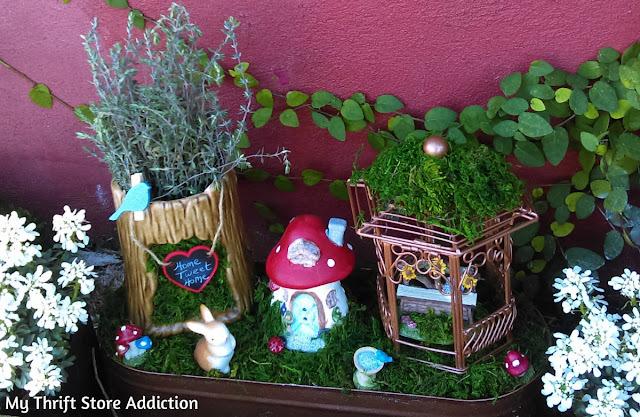 Your sweet fairy garden has me dreaming of spring. Sometimes it is scary how much you and I like the same things. 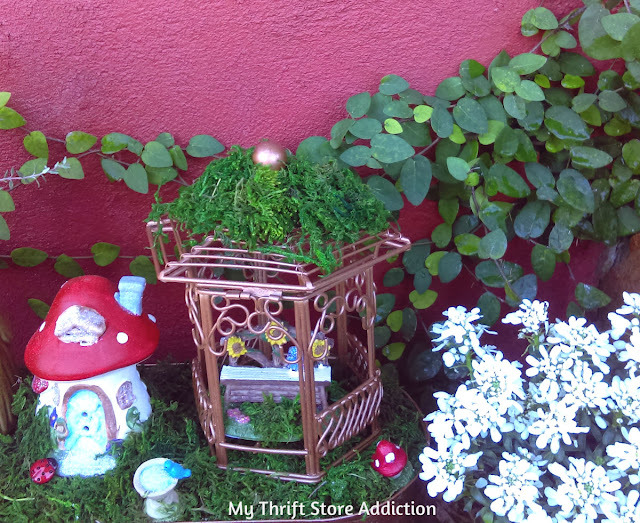 Yesterday I picked up several of the same fairy garden pieces at the Dollar Tree but need a few more pieces. I am planning a fairy garden in a enamel basin. 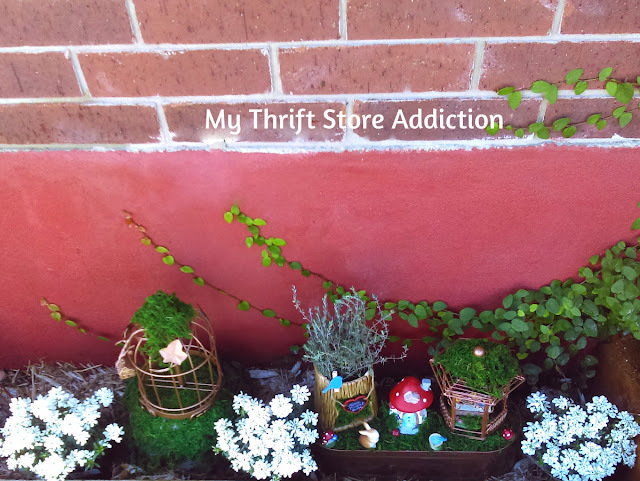 Love yours fairy garden and it was the perfect solution to your bare spot and you were able to use several of the items you found thrifting recently. Aww, that is so sweet & I bet GG will get a kick out of it! Love how you've used your thrifted finds & the little tree trunk planter looks like it was sold with all the moss & other stuff you've added. I'm going to have to pay a little visit to Dollar Tree myself! Aw this looks so fun and so perfect for spring!! :) So many great finds! Adorable. My girls would love making something like this. This is so cute! Loos like a great addition to an empty space! Perfect for your space there and so cute. I have not been in Dollar Tree in so long, but need to go and see what is new for Spring decorating. This is adorable! It's be perfect for a fairy birthday party! Ugh, dang deer. They're so nice to watch in your yard until you realize they're eating all your plants. I like what you did though! So cute! So cute! 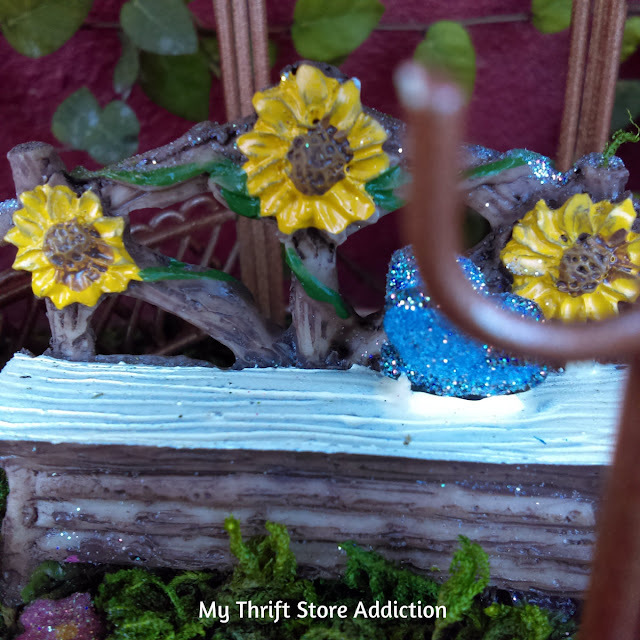 I love fairy gardens and the dollar store finds are fabulous! 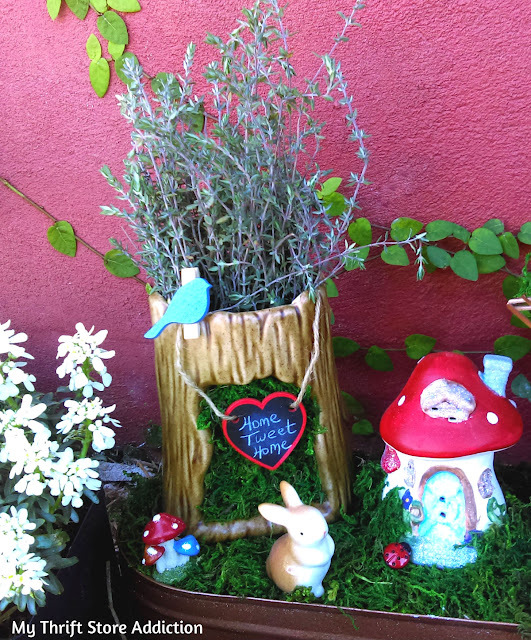 You really made this fairy garden look so great Cecilia! The copper painted pieces are my favorite! This is just too darn cute! Thank you for sharing with us this week at Celebrate Your Story, have a great weekend.